While in a government office to pick up some official piece of paper or other, I met Irfan, the man behind the desk. I was in a foul mood. In general, I detest wasting time on paperwork anyway, and today had been an unusually busy day even before I’d spent an hour in line waiting my turn to get the stupid thing. Irfan, however, sat behind the desk and seemed determined to chat. Lost in my todo list and the inbox on my phone, I zoned him out for several minutes. I responded to his routine questions with as little thought power as possible. Yes. Yes. Four. No. Undeterred, Irfan kept interjecting conversation starters into the requests for data. What did I think of Trump’s election? Had I tried the nearby Malaysian restaurant? What about the Argentinian? Did I travel a lot? If so, had I seen the Sony DAB/DAB+ radio? It’s great for long trips. Within the regular “what is your social security number” information he collected, he was also trying to engage with me better. Were our roles reversed I would probably do the same just to mix things up, if it was my job to ask everybody the exact same official questions all day. 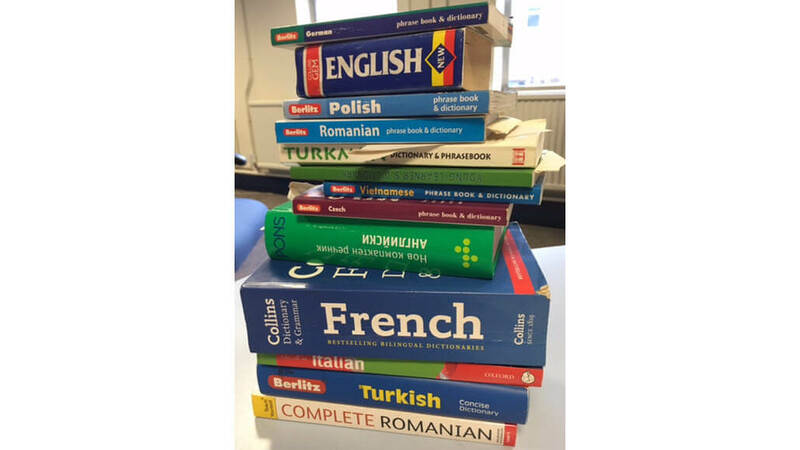 Surprised at the number of languages his stack represented, I asked him if he spoke all of them. “Yes; all these plus a few others,” he replied. Now that was impressive. That meant he spoke at least a few words in English, German, Polish, Romanian, Turkish, Vietnamese, Russian, French, and Italian. He’d already told me that he’d grown up in Pakistan, so I guessed he almost certainly spoke Urdu natively as well. So at least 10 languages. “Do you speak anything else but English?” he asked me. Well yes, as a matter of fact I do. Not 10 of them, though! I have always been fascinated by languages and impressed by those who speak them. I think my grandmother gifted me a love of words. Mimi was always sending me poems from Dylan Thomas, and short stories she’d clipped out of literary journals for me. Although my mother’s side is French-Canadian, in Western Massachusetts Mimi and the rest of our family grew up surrounded by English-only speakers. Even though growing up I didn’t learn a single word in any other language, however, the notion of learning other languages had always called to me. I did find linguistic diversity as my family moved down the US East Coast during my childhood. In Athol, Massachusetts it was “Pahk the cahw in Havahd Yahd.” In Mt. Airy, North Carolina, it was “Put yir pins up, y’all!” (I learned that one quickly my first day of North Carolina elementary school. I figured out “pin” = “pen.” But all alone with my pen in the air as my classmates laughed at me, I realized everyone else had put their pens away.) Marietta, Georgia and Melbourne, Florida also had their own accents and nuances. But these were all nuances of American English. I finally started studying Spanish in high school. Unlike in my dreams, however, I was undeniably horrible. I spoke Spanish like that aunt in Napoleon Dynamite says “quesadilla.” (0:40 in this clip.) It was bad. My Spanish was objectively terrible. Our various instructors would wince when I spoke. So would most of my classmates. I just couldn’t get the sound of the language into my head. I found it impossible to do things like “roll” my Rs. This was a little after the time of the “Ruffles have ridges” commercials (here’s one of them on Youtube), which you’ll remember if you’re as old as I am and grew up in the US. If not, imagine someone saying those words while “Rrrrrrolling” the Rs. Probably better to imagine someone that wasn’t me — because I most certainly could not. My junior year a Nicaraguan kid taught me the incredibly useful* Spanish phrase for “don’t tell me what to do.” For some reason I still don’t understand, I memorized it. I’d repeat “no me digas lo que hacer” for years during nearly every conversation in Spanish. This of course made no sense. This lack of sense would be reflected both in my grades and in my inability to befriend any Spanish-speakers. Not for lack of trying! I would inflict my bad Spanish on anyone I could: waiters, classmates, people passing by on the street. People learned to take great pains to avoid my Spanish and me. Despite my incompetence and obvious lack of innate talent for Spanish, I kept trying to learn the language. In college I took several classes with the coolest dude ever, Señor Alan. Alan was a former Fulbright scholar and played water polo for the Columbia University team. He’d grown up in Latin America and Spain and could speak at great depth on everything from Liberation Theology to the differences in varietals in Spanish red wines (though he preferred beer). So this was the story of my trying to learn Spanish. Screw it up. Keep at it. Gradually make progress to become less bad. Put in the time. I studied abroad in Spain at the University of Sevilla, located in the former tobacco factory where the opera “Carmen” was set. It was a beautiful and historic place to study Spanish. I learned important words like cerveza, baño, and tio. Later, in the Peace Corps, I insulted the mayor of a Dominican town only a few days after arriving in the country. Trying to tell him that his office was hard to find, I attempted to say “I looked all over town for your office, but I couldn’t find it.” Instead I managed to tell him that I had looked all over town for any signs that he did any work but found none. He spent the next 45 detailing each and every thing that his administration had accomplished during his term, all without raising taxes. Then he kicked us out. It was glorious. Eventually I moved to another tiny town in the Dominican Republic, Villa Fundación de Baní. In my two and a half years in the DR, I only met three other people in that town of 7,000 who spoke English. As much as I could, I tried to avoid them. I made a lot of mistakes. I insulted quite a few people. But I did eventually learn Spanish. It took a lot of time, a lot of embarrassment, and a lot of patience. So I am extremely impressed by people like Irfan, who clearly went to it. “It’ doesn’t come to you. *this is sarcasm; it is not, in fact, useful at all to say this. Really ever.